Station Hollywood: Great composer Naushad Ali was remembered on his death anniversary. Great composer Naushad Ali was remembered on his death anniversary. Great Naushad Ali was remembered on his death anniversary on 5th May, 2014. 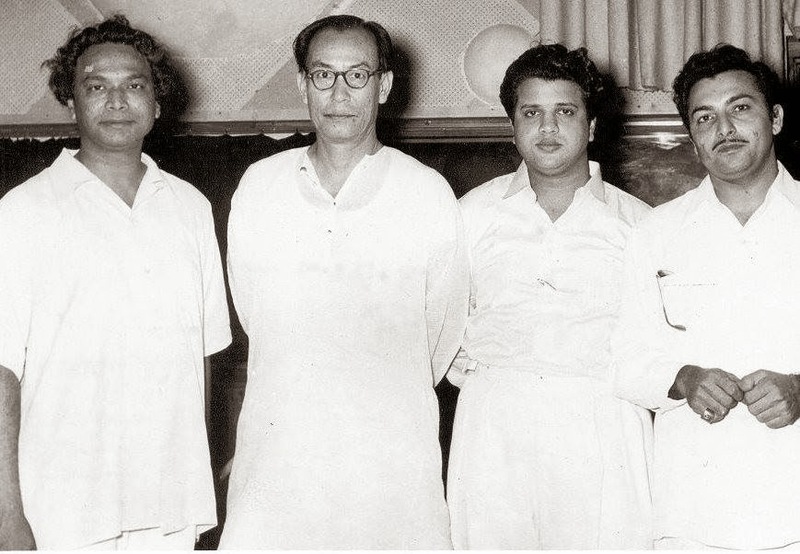 The audience of film music in India remembered dignified composer Naushad Ali on his birthday on 23rd December, 2013. He was a genius composer and shaped Indian film music with his classical gharana in the 40s from where it just grew with variety and innovation. Naushad Ali is remembered for his brilliant tunes over a period of 50 years down the memory lane. In the 40s, he composed music in many films including Anmol Ghari, but he stormed bollywood with romantic songs in Dulari, including “suhani raat dhal chuki” sung by Rafi, all the songs of Andaz, where he composed Rafi’s songs for Raj Kapoor and Mukesh’s songs for Dilip Kumar. In the 50s, Naushad’s composition in Baiju Bawra made the listeners speechless. He won filmfare award for the best composer for his brilliant classical presentation in songs like “wo duniya ke rakhwale”, “man tarapata”, “tu gangi ki mauj”, etc., sung by Rafi and Lata. Rafi’s range was used to perfection and from that time the Rafi Naushad combination provided gems after gems. The different ragas and their timings were explained by Naushad in the film. Bharat Bhushan and Meena Kumari gave able lips in the songs composed by Naushad. Songs of Uran Khatula, like “wo dur ke musafir” sung by Rafi for Dilip Kumar also shook bollywood in the mid-50s. In the 60s Naushad was unstoppable. His composition in Kohinoor for Rafi titled “madhuban me radhika nachere” and “do sitaron ka zameen” picturised on Dilip Kumar displayed the brilliance of Hindustani ragas. Naushad’s composition in Rajender Kumar’s Mere Mehboob, Naushad displayed the ghazal culture of Lucknow and Aligarh. The songs “mere mehboob tujhe meri muhobbat ki kasam”, “ai husn zara jag”, etc. sung by Rafi and picturised on Rajender Kumar was per se excellent. Naushad composed light songs in Mughal-i-azam for Lata including “pyar kiya to darna kya”, “mohe panghat ke nandlal”, and again composed thumri sung by Bare Ghulam Ali Khan in the same film. Naushad also composed Bhojpuri music for Dilip Kumar in the film Ganga Jumna. The songs “nain lar jaihe” sung by Rafi was one of the examples of Naushad’s control of Bihari folk tune. Naushad was at his best in Dilip Kumar’s Leader. All the songs in the film sung by Rafi and Lata flabbergasted the listeners, including “ek shahenshah ne banwake haseen tajmahal”, “teri husn ki kya tareef karun”, “mujhe duniya walon”, etc. Naushad was excellent in Dilip Kumar’s Ram Aur Shyam. All the songs sung by Rafi and Lata in the film including “aye hai baharen dekho”, “yeh raat dulhan bangayi”, “mai hoon saki”, etc. Critics consider Dil Diya Dard Liya as one of the best creations of Naushad. All the songs in the film became superhit including Rafi’s “dilruba maine tere”, “koi sagar dil ko behlata nahi”. Naushad Rafi and Dilip Kumar continued with their level of excellence in the film Aadmi, with Rafi’s songs like “na aadmi ka koi bharosa”, “aaj purani rahon se”, etc. Besides, Naushad composed excellent music in Rajender Kumar’s Palki, Saathi, Ganwar, etc. Rafi’s hit songs in those films included “dil-e-betaab ko seene se lagana hoga” sung with Suman Kalyanpur. Naushad faded away from film music in the 70s, causing huge loss to the film industry. The classical gharana related to thumris, kajris, ghazals, etc., faded away with Naushad. Music became popular, but lost its class. Naushad received Dadasahab Phalke for his excellent contribution to bollywood music. His songs and the films should be preserved and restored. Happy birthday to Amrish Puri. Happy birthday to Karishma Kapoor. Happy birthday to Mithun Chakravarty. Happy birthday to Sunil Dutt. Happy birthday to Rajesh Roshan. Remembering Satyajit Ray on 2nd May, 2014. Happy birthday to Manna Dey. Happy birthday to Pooja Bedi.